the Enterprise Risk Management (ERM) framework, consisting of various risk management mechanisms which help to ensure that the risk profile is dynamically optimized, whilst remaining aligned with the risk appetite framework. As part of its capital management, a (re)insurer’s risk appetite defines the quantity of risk that it wishes to accept to achieve a desired level of profitability. Risk appetite can differ from one (re)insurer to another. Whether a company’s risk appetite is low or high, the management needs to properly understand its consequences. SCOR has a mid-level risk appetite, which is revised every three years. SCOR currently uses a solvency ratio target range and an expected profitability target to provide a complete definition of its risk appetite. Volatility is controlled through diversification and the capital shield strategy. SCOR has had the lowest volatility in the industry since 2005.
the “footprint scenarios” provide an impact assessment on the Group under selected deterministic scenarios. SCOR uses either key historical events or other extreme events to assess their impact on an as-if basis on its current portfolio and in-force retrocession / hedging mechanisms. This approach provides an alternative and complementary perspective on the Group’s exposures. through the Solvency buffer (or Capital buffer) and the Group’s dynamic solvency scale, SCOR monitors the amount of capital necessary to respect the Group’s risk/return objectives and safeguard its franchise. SCOR has developed a full and holistic internal model over the last 10 years, on the basis of the Group’s experience and expertise. This model covers all material quantifiable risks to which the Group is exposed (Life and P&C underwriting risk, market and credit risk, operational risk) and reflects SCOR’s risk profile and strategy. It is founded on high scientific standards, using systematically stochastic simulations and modelling dependencies across risks, based on cutting-edge methodologies. The internal model simulates the interactions between the assets and liabilities of the Group under various scenarios and determines the capital level necessary to ensure that the Group is solvent with an annual probability of 99.5%. Support the analysis of strategic decisions, such as M&A or significant investment decisions. SCOR has developed a solvency scale which drives a process of gradual escalation and management responses, depending on its solvency position based on the internal model. 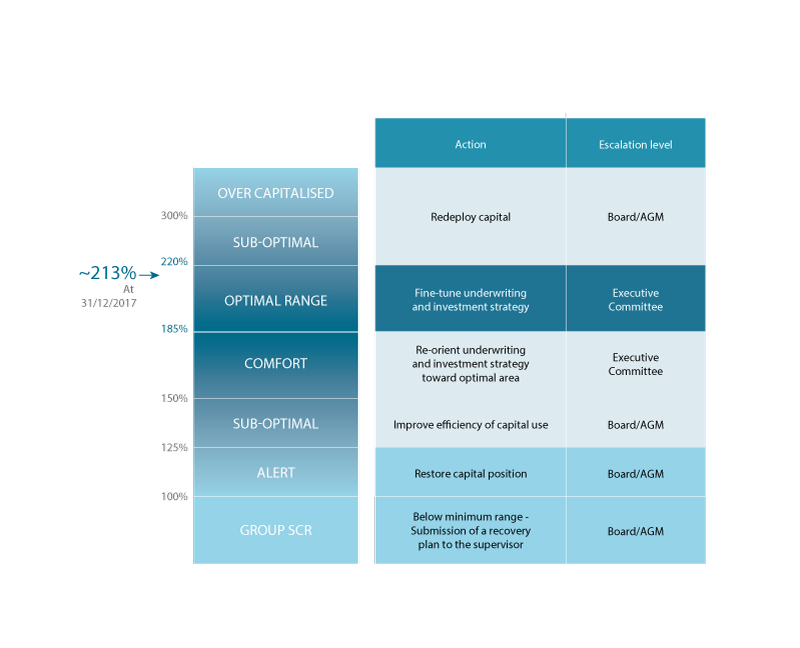 The optimal capital range (defined as a solvency ratio of 185%-220%) enables the Group to achieve the best balance between a strong solvency level and efficient use of capital. Hence SCOR aims to make the best possible use of the numerous options at its disposal to manage and steer its risk and capital positions toward the optimal area. SCOR’s solvency level is strongly anchored in the “Vision in Action” plan, enabling optimal use of its capital under the Solvency II regime. At 31 December 2017, SCOR’s expected solvency ratio stands at 213%, in the upper half of the optimal solvency range of 185%-220% as defined in the “Vision in action” plan. Water risks constitute major challenges – both in terms of threats and opportunities – for society as a whole, and for the re/insurance industry. Yet, they are widely underestimated, disregarded or simply ignored. With its new Position Paper on Water Risks published in November 2016, the Emerging Risks Initiative (ERI) of the Chief Risk Officer (CRO) Forum has aimed at synthesizing what water risks represent for the reinsurance industry in terms of scarcity, pollution, health, treatment, conflicts, regulatory and reputational risks. The CRO Forum is a group of professional risk managers from the (re)insurance industry that focuses on developing and promoting industry best practices in risk management. Made up of Chief Risk Officers from large multinational insurance and reinsurance companies, including SCOR, it aims to represent the members’ views on key risk management topics, including emerging risks. The CRO Forum’s Emerging Risks Initiative has published an updated Risk Radar every year since 2005.This Risk Radar classifies each risk by nature, time horizon and expected impact.